What could be more romantic than seaside wedding in Italy? delicious food and famous Italian vines! Beach wedding in Italy leaves unforgettable emotions. It helps to plunge into romantic atmosphere and allows to enjoy very specific moment of your life. Such a ceremony might be official or symbolic. As in the first case, the legal registration of marriage is to be held. 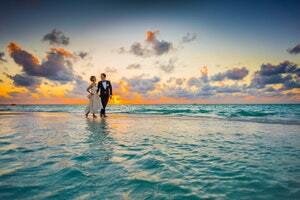 Wedding-Italian agency provides a wider choice of programs, places and ceremonies. All you need is to select the proper one and get in touch with our manager. Rimini – picturesque spa city on the coast of warm Adriatic Sea. Famous Mountain Titano is situated just a few kilometers away from it. This town is a wonderful place. Soft climate and an average daily temperature in summer of 27 degrees Celsius. Guests and newlyweds fell themselves convenient all year-round tough fantastic combination of warm climate and sea air. Ravenna city is situated on the Adriatic Sea shore in the wonderful Emilia-Romagna region with Mediterranean climate and increased humidity. It is believed that spring and autumn are the best seasons for wedding planning. Big number of comfortable hotels, fine restaurants, beautiful places for wedding photography helps to conduct the celebration on the highest level. Such kind of ceremony might become a remarkably memorable one.